Size: Typically 12-30 pounds but can grow larger. 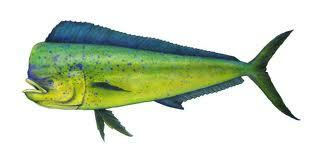 Description: One of the fastest growing fish in the ocean, one year old Mahi can be over 20 pounds! An aggressive fish that travel in schools willingly attacking troll bait and pitch baits. Fishing Location: Offshore as well as near the outside of the reef. It's very common to find large schools of Mahi near weed lines and weed paddies. Can be caught all year but the warmer months are best. Size: Typical Key West Sailfish are 40 pounds and seven feet long. Description: The Sailfish is the worlds fastest swimmer! Acrobatic, with high headshaking jumps and greyhounding leaps accross the water. This is an awesome fish on light tackle. Fishing Location: Sailfish can be found on the reef chasing Ballyhoo, as well as outside the reef and offshore. Weed lines and color changes combined with bait activity is a prime spot for Sailfish. Size: 20-40+ pounds. Florida State Record 139 pounds. Description: Vertical Zebra stripes and a mouth full of teeth. Ultra fast swimmers that dump line off the reel in a hurry! Fishing Location: Offshore over structure and wrecks is the typical location for catching Wahoo. Steel leader is a must because of their ability to easily bite through standard leader. High speed trolling or slow drifting live baits are our preferred method. Size: 10- 30 pounds. Florida State Record, 45 pounds, 8 oz. Description: A hard fighter and great eating fish. Blackfin tuna have oval-shaped bodies, black backs with a slight yellow on the finlets, and yellow on the sides of their bodies. They are only found in the western Atlantic from Cape Cod to Brazil. Fishing Location: Offshore in 150 to 400 feet of water. Blackfin tend to school over underwater structure such as humps and wrecks. Early morning and cloudy days seem to provide the best Blackfin fishing. Size: Up to 40+ pounds. Florida State Record, 90 pounds caught in Key West. Description: Large Kingfish are called "Smokers" because of their fast runs when hooked. Steel leader is a must because of their sharp teeth. Common in the waters around Key West. Kingfish respond well to slow trolled live bait. Fishing Location: Offshore near the reef and wrecks with some occasionally be caught over the reef. Description: The Black grouper is not a schooling fish but instead prefers to live alone. Mostly found in waters that are 12 to 100 feet deep. As with all groupers Black Grouper are great fighters. Fishing Location: Commonly found around rocky or coral reefs but can be caught in other locations as well. Sub adult Black Grouper enjoy living in sea grass beds. Size: 5 - 20 pounds. Florida State Record, 42 pounds 4 oz. Description: The Red Grouper can actively change his color to more white or more red. The inside of his mouth is a scarlet orange. Fishing Location: Commonly found around coral reefs and over hard and muddy bottoms. Juveniles found offshore along with adults greater than 6 years old. Fish from 1 to 6 years occupy nearshore reefs. Size: Up to 60 pounds. Florida State Record, 142 pounds. Description: A large member of the Jack Family, they are often referred to as "Reef Donkies" because there incredible pulling power! Fishing Location: Wrecks, rocks and reefs. They are versatile fish that takes up residence wherever they can find cover and ample food. Size: Up to 12 pounds. Florida State Record, 17 pounds 6 oz. Description: A willing biter. Lines and oval markings on its side differentiate it from the Spanish Mackerel. The Cero is a very good eating fish. Fishing Location: On the reef and backcountry channels, as well as in open water near the reef. Size: 6.8 to 14 kg though some may exceed 59 kg. Description: The Almaco Jack is related to the Amber Jack. As is common with all Jacks, the Almaco Jack is a strong determined fighter that is enjoyable to catch! These fish are found in small schools and feed both day and night, which makes them easy to catch when they are in the vicinity. Fishing Location: these fish can be caught near reefs and wrecks in water that ranges from 15 to 480 feet in depth. Atlantic Sharp Nose Shark "Key West Wreck Shark"
Size: Maximum length is about 4 feet, but the average adult fish seem to be 39 to 42 inches long. Description: A relatively small shark with a long snout. Coloration includes varying degrees of blue, brown, olive green, and gray. Fishing Location: These fish can be found from the surf line all the way out to almost 1000 feet of water. The sharks seem to prefer shallower waters that are less than 30 feet deep during later spring and summer months, but travel into deeper waters of their range during the wintertime. Size: Spadefish commonly weigh from 3 to 10 pounds and can go as high as 20 pounds. They max out at about 3 feet in length. Description: The Atlantic spadefish is also commonly called an angel fish even though it actually isn't one. Spadefish are known to be a hard fighter. Fishing Location: Found around reefs in depths of 3 to 100 feet. In open water spadefish can often congregate in schools up to 500 fish. Size: Typical size is 3 to 6 pounds. Description: The banded rudder fish is also known as the slender Amber Jack. Fishing Location: They can be found in water that has a hard bottom as well as reefs, in short channels that have structure, oil rig locations. The Banded Rudderfish seems adept at living in a variety of depths and environments. Size: Most of these snappers are around 12 inches in length and no more than 16 inches, with an average weight of 3 to 4 pounds. Description: Their name is derived from the Black Spot at the base of their pectoral fins. Fishing Location: Black fin snapper can be found around sandy and rocky bottoms that have ledges and are situated in waters 200 to 300 feet deep, with adults preferring deeper water, and juveniles preferring shallower water (20 - 60 feet deep). As with many species of snapper, when you find one, you find more! The Black Fin Snapper often travel in schools of 20 to 30 fish. Size: Typical size is a little under 5 feet, with 9 feet being the maximum size. Maximum weight is approximately 270 pounds. Description: This shark has a strong and long, streamlined body. This shark’s back is typically gray to brown in coloration with a white belly. Fishing Location: Mostly found in water that is less than 100 feet deep. Black tip sharks prefer bays that have a muddy bottom and drop-offs near coral reefs. These fish tend to follow the seasonal migration pattern where they travel north off the coast of North Carolina during summertime and then back again to South Florida during the winter. Size: Small bluefish called "Snappers" are about 7 inches long and can grow up to 40 pounds, however a 20 pound bluefish is approaching the top end of what anglers can expect to catch. Description: Gray to blue-green in color these fish are a popular quarry for anglers all up and down the eastern seaboard. Bluefish are a great fighter and an aggressive feeder that are known to strike at anything. Fishing Location: These are a migratory fish that are found off of Florida during winter months and by mid-spring (April) they have begun their journey north. Bluefish can be found in schools of up to several thousand fish. Juvenile bluefish congregate over sandy bottoms but can also be found in areas of mud, silt, clay, and vegetation. Adult bluefish utilize inshore and offshore waters and as is evident in their seasonal migration pattern, they prefer warmer waters. Size: these fish can attain weights of over 2000 pounds, but the largest ever caught out of Key West, was caught in 1990 and weighed in at 665 pounds. Description: Marlin do live in the waters off of Key West, however if you're the type of angler that has to catch something every day, or even every other day, then Blue Marlin fishing isn't for you. Blue Marlin are a special fish and so are the anglers that fish for them. Hours and hours and even days and days without raising a fish aren't unheard-of when Marlin fishing, this is why it is such a great achievement when you do actually catch one. Keep in mind that if you don't fish for em' then you're not going to catch em'! If Blue Marlin is on your list, then you need to put in your time. The best captains in the world can't catch them if they aren't there, and finding where “there” is, can take some effort. In general in Key West, Blue Marlin are a rare catch, White Marlin are more common. Fishing location: 20 miles south of Key West is a place known as "The Wall" or "Wood's Wall"; this is the outer edge of the continental shelf and from here out is the usual hunting grounds for Key West Blue Marlin. Size: Maximum length for Blue runners is around 70 cm and maximum weight is about 5 kg. Most fish are below 35 cm in length. Description: Blue runners make great bait for a variety of fish in the Florida Keys, but they also provide great light tackle opportunity for young anglers. Fishing location: Blue runners can be found both inshore and offshore however most of the time they are caught over reefs. Sub adult fish are found in shallower reefs and lagoon areas later moving on to deeper water as adults. Like many types of bait fish, Blue Runners have a strong tendency to congregate near any large floating debris. 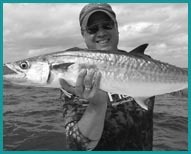 Description: Bonefish make up one of the great trifectas (a trifecta is accomplished after catching Bonefish, Permit and Tarpon all on the same day) and are highly sought by shallow water anglers in and around Key West. Hard fighters and a challenging quarry, they are definitely a species that can get under your skin and create a lifelong addiction. Often found in small to medium size groups. Fishing location: Shallow sand flats and grassy flats. This is sight fishing for the most part. These fish fight like hell! Size: average size is a little under 3 1/2 feet which makes them the smallest hammerhead shark. Description: Also known as the Shovelhead shark is related to the hammerhead shark, and that is exactly what it looks like, a small hammerhead. These little sharks can be found on the flats as individuals or in small groups. Fishing Location: Here around Key West they’re found when our waters are the warmest, meaning spring, summer, and fall. During the winter these fish migrate towards equatorial waters. Kevin Newell is the owner of Total Fisherman and he will be your charter captain here in Key West. Total Fisherman Guide Service was founded in 2000 and I have enjoyed every minute since! More About Us or Contact Us. Click here to go fishing with Total Fisherman Guide Service! Copyright © 2019 Total Fisherman Key West Fishing Charters. All Rights Reserved.